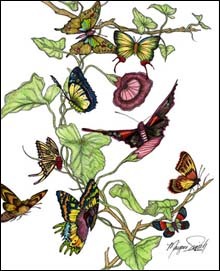 Many cultures believe that when we die our souls go to heaven as "Butterflies". I don't know about that, but these tiny winged creatures are strikingly beautiful to watch in flight. 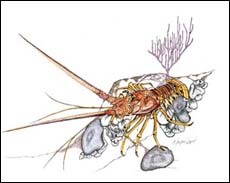 The Florida Spiny Lobster is much different than it's cold water cousin the Maine Lobster. The Spiny Lobster thrives in warm waters from the shallows to the deep ocean. It defends itself with long rigid feelers and has no large claws. It is prized for it's succulent tail meat. The African Leopard "Ceasar" (Panthera Pardus): Pound for pound the strongest climber of the large cats. The Leopard is capable of killing prey larger than itself. 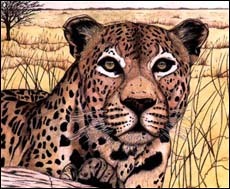 Called "Chui" in Swahili, the African Leopard's only predator is Man. Leopards have long been preyed upon by man for it's soft dense fur with it's beautiful circles called "rosettes". "Pelican" Second only to the Palm Tree, the Pelican is a symbol of all things "Florida". Anywhere there's fish you'll find these guys waiting for a handout. They make a very pretty picture atop a dockside piling before a crimson sunset. 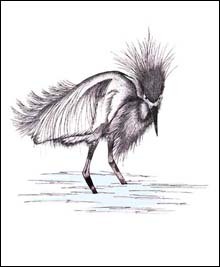 "Snowy Egret" Once killed for it's beautiful plumes, the Snowy Egret is thriving in it's Florida Keys habitat and is no longer hunted. 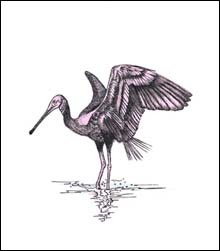 "Roseate Spoonbill" These beautiful pink birds with scarlet red eyes can commonly be found feeding in shallow Gulf and Florida Bay waters. 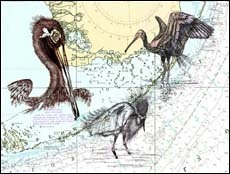 "Feathered Friends" Our three feathered friends are pictured together with a Florida Keys nautical chart as a backdrop.